27 min 28 sec ago. 49 min 42 sec ago. Secretary of State Ross Miller and attorney Adam Laxalt went at it for an hour on Friday on Vegas PBS, with all the nastiness and ferocity that has marked the media campaigns bubbling forth in a strikingly contentious debate. Experience is the major difference in this race. I commend Mr. Laxalt for his military service, but he’s never handled these cases. He doesn’t know what these issues are really about. He’s never looked these seniors in the eyes that have lost everything that they’ve worked in their entire lives to put away. I have, both as a prosecutor leading these individuals up to the witness stand to have them tell their story ultimately convincing that judge to impose a substantial sentence. Then in leading the investigations to put these individuals behind bars. That’s why I’ll be ready on day one to go after these types of offenses, and I don’t think my opponent can point to anything in his experience that has prepared him to do that. I mean if you’re referring to my campaign, the ad that we’ve put out. We’ve made it very clear that we think using these documents are shameless. My law firm immediately stated that these were not, did not represent the work I did at that firm. They said I was an excellent attorney, and they noted that I’m always welcome back and would be promoted. And they said these just simply are a false representation. So, if my opponent had anything to do with that or knew anything about that of course that’s a question for you guys to ask. I haven’t insinuated that. The reason we’ve said that he’s responsible for these ads is because he paid the Democratic Party $50,000, and the Democratic Party has been running ads for two consecutive weeks using this stolen, illegal document and the Nevada voters are fed up with it. They’re tired of this kind of thing. They want two guys to get in the arena, talk about their experience, talk about their vision for Nevada. They don’t want this kind of attack campaign, and I’m just very disappointed that my opponent would actually fund this kind of attack ad. To your point, he is going to be the top lawyer in the state and every lawyer knows you can’t use a stolen document. Confidentiality is the most important thing for a lawyer, we all know this. That’s part of our code of ethics. So, that is the root of our campaign ad and we stand by it. First, that $50,000 had nothing to do with the ad; it was the usual GOTV contribution candidates give to the state party. But even if it weren't, what is the point? The ad clearly implies Miller stole the documents. The portions of the reviews in question are from 2011-12 and do not include other highly favorable feedback Adam received during his tenure with the firm. Notice that does not contradict the evaluation. And the firm declined to provide any of that highly favorable feedback when I asked. That was a CYA statement. Period. As for Laxalt not saying he insinuated Miller stole illegal documents, that is exactly what that ad does. Anyone watching it can see that. And he has no evidence that the documents were either stolen or that my obtaining them was illegal – if he did, wouldn’t he have filed a complaint? There’s nothing more alarming then what he just said. He’s running to become the state’s top attorney. He has no evidence that I had anything to do with these documents being put out in the public because I didn’t. I don’t know who put these documents out in the public, but here are the facts as to what happened. He went out on “Nevada Newsmakers” and said that he had glowing reviews from his law firm. We know that wasn’t true. Then when they were released and it showed how abysmal these reviews were, that they called him a train wreck, that they said he was incompetent, possible termination. He questioned the authenticity of those documents. We knew that wasn’t true later when he had to acknowledge they were in fact authentic. Then he said he hadn’t seen them. We know by looking at those documents that in fact these attorneys had met with him, explained to him that he wasn’t meeting his performance standards, and recommended that he be held back which he was disappointed in. And now he’s trying to point the finger, to shift the blame, to suggest these things are stolen. Everything I’ve ever done in my career is open for the public to be able to look at and examine. Obviously, we should ask him to do the same so that he can be accountable on his record because the bottom line is the people that know him best say that he’s not qualified for this position. That’s a significant issue, and the public should absolutely look into that. He’s referring to an evaluation, a note that I still have never held in my hand. My firm stated emphatically this did not represent the views of the law firm that I’ve been a very solid attorney there, represented my clients very well, and they are very upset as they’ve issued a third statement saying this is just a misrepresentation. Oh? I ask again: Where are the glowing comments? I’d like to ask, he has over $80,000 worth of credit card charges to his Chase MasterCard. These are not itemized. It doesn’t say a thing about what he’s spending all these campaign expenses on. I can tell you we itemize everything. We itemize the gas I get, the McDonald’s I pick up. And if he is Mr. Transparency, I think the voters deserve to know. What is he spending over $80,000 on of other people’s campaign money? This is in addition to his $100,000 salary. That’s a well-constructed attack. And what really surprised me is that Miller let it hang out there, never addressed it. Maybe it’s because it’s true, that he has that much on the credit card since 2010. Now, it is true that others do the same with expenses – indeed, most do. But it should not be allowed. And if you are a crusading secretary of state, as I have said about his gifts, you should be more transparent. I think it’s funny that Mr. Laxalt talks about the fact that he would enforce the law. But you look at other instances like the Cliven Bundy situation for example where he defended Cliven Bundy. A man he called his friend. In this situation, Cliven Bundy had exhausted all of his legal appeals, found to be trespassing on our taxpayer land. Obviously, the BLM took an overly aggressive approach in their response, but Mr. Laxalt defended him and refuses to acknowledge the basic rule of law. And so, this seems to be an issue of convenience for him. When it suits his purposes he says that I’m not going to inject myself into the policy, but when it comes to other issues he certainly would. The pair then used unrelated questions to banter about Bundy. Ross Miller has flat-out lied about Bundy. I have never even mentioned once that I support Cliven Bundy. I’ve certainly never said that he’s my friend. I don’t know Cliven Bundy, and he’s trying to make this, take advantage of a hot button political situation and somehow try to stick me with this, and it’s just grossly irresponsible of him. I’ve issued one statement on that, and it was exactly what the Governor said which is the Federal Government should not create free speech zones and the Federal Government should not use force to retrieve cattle. 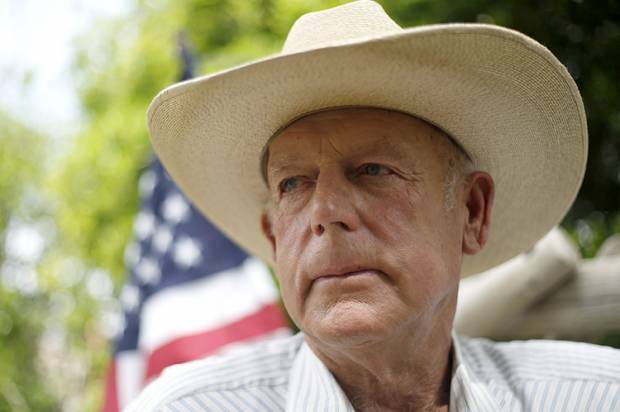 Cliven Bundy broke the law. As the Attorney General, of course I wouldn’t support someone that broke the law. That’s the job of law enforcement to make sure, we make sure the law is enforced and people can’t break the law. I want to get back to this Bundy situation because he said this was a fabrication. Look, it’s on your press release. Go back and look. You issued a press release in April that directly said that the people who are involved are ranchers, fellow friends and fellow church-going members of our community, you said that. People asked you to retract it, you didn’t. You’re now trying to claim you didn’t say it. I think you’ve got a problem telling the truth here. “Like many Nevadans, I am disturbed by events that have transpired near Bunkerville. The men and women involved are ranchers, friends and fellow church-going residents of our state. These individuals appear to be peacefully asserting the fundamental truth that there are, in fact, Constitutional limits to the power of our federal government. In response, the BLM over-reached, launching a military-style invasion against a small Golden Butte area rancher. Meanwhile, the BLM simultaneously designated "First Amendment Areas" nearby. “Our federal government derives its power through the liberty that each of us yield to it. Therefore, it should not unnecessarily use force to intimidate its citizens while simultaneously playing lip service to their right to free speech. It is my hope that cooler heads will prevail, that our laws and our Constitutional protections will be fully respected. I urge the BLM to reconsider its approach. “And finally, this is yet another example of why it's important for Nevadans to gain more control over our lands and the decision-making process in how it is managed. When the federal government owns and regulates seven of every eight acres of our state, confrontations on bad policy, regulation and management are going to continue. It's how we ended up in the Jarbidge dispute, the fight over Yucca Mountain, numerous debates over endangered species protections and countless other battles. As you can see, Laxalt never said anything about Bundy breaking the law. And while he never called Bundy his “friend,” he did say those involved were. So the militia types were his friends but not Bundy? And he does refer to Bundy as a victim, a small "Golden (sic) Butte area rancher." We got a complaint. I don’t think there was any merit to it whatsoever about my picture being involved on the top of the website. We put that up there for a reason, so that people know that it’s an authentic website that they’re dealing with when they register to vote and the like. It’s on every single page in our website. It bothered somebody. We didn’t think they were right, but the customer is always right. We just simply took it down, hoping to put the issue to bed. This complaint was filed by a former commander in the U.S. Navy, someone that has led many, many men in very tough situations. I think Mr. Miller calling this a political stunt is absolutely outrageous. He’s the Head of Elections. Someone files a complaint to say, as the Head of Elections he cannot put his name and face on a ballot. That is in fact the law. You cannot be within 150 feet of a polling station. Explain to me how he’s allowed to put his name and face in the ballot taking advantage of our overseas military voters. Right there free advertisement. And what’s really concerning is not only that he says this is a political stunt, is that he gets to decide whether he broke the law or not. Where is the challenge to that? Who gets to review whether or not Ross Miller has actually broken the law or not? Does he just get to decide? And we’re all just supposed to accept it? Everybody realizes him removing his name and face shows culpability. How many military voters saw that name and face for, was it a week? Was it 10 days? How many people saw that? How many people voted after seeing that? These are the numbers we should know, and we need to have an independent investigation if my opponent believes he’s so above the law as he’s proved many times in his career, that somehow he gets to decide and be judge and jury whether or not he’s broken the law or not. This is not what we want, someone that doesn’t see a conflict of interest, the most basic conflict of interest that any lawyer would see. This is a picture on my website. This isn’t electioneering at a polling location. This is a picture on my website, and why does that exist? Because we know in battleground states that when people go to register to vote, you sometimes get these out of state groups that they think that they’re registering with a governmental agency. They’re dealing with somebody with an agenda who may throw away those registration forms. We put the state seal, my picture, the Secretary of State’s Office up there so that people know this is a web portal where I’m dealing directly with the Chief Officer of Elections. That serves a legitimate purpose. That’s why it was up there. So, to try to use this program which is groundbreaking to try to make it easier for our men and women in the military to vote, we’ve done a better job of that, we’re getting awards for our ability to do that and to turn turn this into a political issue I think is just absolutely sad. Um, well, then why take it down? There was no confusion in the last debate. I merely transposed the two words, as can happen in a debate. Transposed? Are you kidding? Laxalt repeatedly confused the two laws, had to be corrected by Sebelius and even the Review-Journal said it was "alarmed" by that lack of knowledge. And, by the way, he had weeks to prepare for that because the press association folks told both candidates what would be discussed. When asked about Yucca Mountain, for example, a couple months ago. It didn’t sound like he even knew where Yucca Mountain was, couldn’t make up his mind. Even the Governor had to come out and say I disagree with Mr. Laxalt’s position. That’s embarrassing and for an issue that’s that important to our kids’ public safety and our grandkids’ public safety, we can’t afford for our top attorney in a standoff of that nature to blink as Mr. Laxalt did. It shows weakness. People are tired of career politicians that hand out special favors to people that take care of them, and they take care of them whether it’s with gifts or whether it’s, you know, in ways that my opponent as we’ve talked about throughout the campaign, taking them out to dinners and to expensive fights and ball games. You know people are tired of having this small set of special interest have access to politicians expecting presumably something back in return. And as long as we’re talking about transparency I bring up again, where is this over $80,000 that Mr. Miller spent on his campaign credit card? Where is all that going for Mr. Transparency? You know, he wants to claim he’s transparent, yet $80,000 is an awful lot of money to most voters. He ended the last debate by saying that I was taking money from special interest and he didn’t have a single lobbyist on board. Mr. Laxalt, let me introduce you to a couple of the lobbyists that are here. Right here in the front row, one of your chief sponsors is a lobbyist for the nuclear industry. Your campaign manager that’s sitting right here is also a major lobbyist. You can’t have it both ways. Why don’t you tell the Nevada voters the truth on some of these issues. Miller was referring to ex-Gov. Bob List, who used to work for the nuclear industry, and Robert Uithoven, who lobbies for Las Vegas Sands. And the question about them was then asked by Sebelius. What I was speaking to in that debate was the fact that my opponent is the candidate of the grand majority of lobbyists in this state. My opponent is supported by nearly the entire lobbyist corridor. They want him to move up the ladder. And this is the kind of thing that I’m fighting against. I think Nevadans want new blood. I consider myself part of the new generation, the generation that served in Iraq, served in Afghanistan. We want to make a difference. We want to turn things a different direction, and we want to show real leadership. This is why we’ve come from 17 points down to an even race because Nevada voters recognize that I can bring something unique. I can bring new energy and someone that is not receiving, as we all found out, over $70,000 in gifts from all the special interests in this state. It’s very concerning to me someone that’s going to be the top lawyer of the state and has to make major decisions about companies and our agencies, that he would take this many gifts from special interests. It is, it is probably concerning Nevada. We’re going to find out in the next few weeks. Something I certainly worry about. Laxalt’s comment in that debate was not equivocal. He said: “I have no support from lobbyists in Nevada.” Period. The gifts issue, though, is a real one for Miller – a combination of his frivolous acceptance of them and Laxalt and his allies pushing the issue, aided by pictures from Miller’s own Twitter feed (! ), has made it so. The real story of Miller’s gifts is here – more than $80,000, but only about a quarter from folks with direct interests in state government. The issue of hypocrisy is legitimate. Miller asked for it and made it worse with those campaign-ad-ready pictures from his own social media account. He has not even practiced law long enough in this state to legally run for judge. He can’t even put his name on the ballot, doesn’t have enough legal experience to legally file for office. He’s running to become the state’s top attorney and what is going on here? Adam Laxalt has a secret he doesn’t want the public to know. That at the end of the day when you look at his records, his qualifications, all of these document that he refuses to put out from his performance reviews, his full military records that he clearly has access to. The people that know him best say that he’s incompetent. They say he’s not qualified for this job. We’ve put out our military records. In fact, I encourage to you go on my website adamlaxaltforag.com. They are on there. And my evaluations have said as we saw in the papers that I was an outstanding attorney. I worked in some of the most difficult environments you can imagine, including deploying to Iraq where the legal experience I had to do there is an experience that, a fraction of lawyers in the entire world have ever had to do. It’s been an issue in the campaign this issue of gifts and who received what and from whom and in what amounts. Some of the gifts you received as you’ve pointed out while in office were for educational events, for instance which were sponsored by fairly neutral parties. But more troubling were gifts from prominent special interests, specifically the mining industry, station casinos and various utilities in Nevada. Why did you choose to not at least stop taking gifts for the interim that you were campaigning through your push for reform against that very type of practice? And the reason that this issue has become so prominent is because I’ve become a, I’ve been a pioneer on this issue not just in pushing for more transparency in the process, but reporting absolutely everything. As you point out the overwhelming majority of everything that I’ve reported constitute educational trips sponsored by nonprofits where I go out and try to work on leadership skills and work with colleagues throughout the country. But the bottom line is I put that out there for the public to see, so that they can make their own judgment. There’s nothing on there that poses any conflict of interest whatsoever. That’s why I disclosed it. So, it’s unfortunate that they are trying to penalize me for disclosing while at the same time Mr. Laxalt refuses to release his military records. Said he didn’t have them on Nevada NewsMakers. He came in the middle of a crisis after these Lewis and Roca reviews were put out in the media criticizing his ability to become, or criticizing his background as an attorney. Lo and behold, he then puts out selected records. I think that suggests he’d had them all the time. Why don’t you release them all so that we can get to the bottom of this? When you say you were prosecuting terrorists in Iraq, is that true? Doesn’t seem to be. Seems like you were processing paperwork. You don’t the level of experience that you claim you do. Processing paperwork, Ross? Do you have any idea what it’s like to go into a war zone in the middle of the surge, in the middle of the most challenging time we faced in Iraq? It’s just appalling. Obviously, you’ve never served in the military which you could have with your 30s. Instead you decided to sit in the Secretary of State’s office, and work your way up a political career. So, I take grave offense that you’re attacking my military record. We’ve released our records. They’re all there and I have no idea what you’re even talking about. If you talk about being a pioneer, and what you’re a pioneer of is in receiving gifts. You’ve received more gifts than any elected official in this entire state and it’s incredible. You say that some of these are educational opportunities, yet Governor Sandoval is reporting less than a thousand dollars in gifts as a sitting Governor and as Attorney General accepted no gifts. You make $100,000 a year. Your wife has a good job. You can pay for your own educational opportunities. People want to know, why are you taking gifts from all the special interests that Elizabeth just mentioned? What do these people want from you? It’s an important question. You have to be above the law as the Attorney General, that’s something I pledge to do. I’m coming out of the military. I’m not owned by any special interest, and I’ll work for you every single day I’m in that office. That was Laxalt’s best moment of the debate. Forget that we don’t know if he processed paperwork or prosecuted anyone. His campaign has not been very forthcoming, although they have recruited, as might have been expected, military types including a general to defend him. Frankly, I'm not sure whether or not what exactly Laxalt did in Iraq has any bearing on his fitness for AG; it is his own changing description of his experience that makes it an issue. No matter what the truth is, Laxalt's response was pointed and probably effective for those watching. He might as well have done a mic drop. After a few questions on issues such as pot legalization that produced little disagreement, the final question from Thompson was whether Miller would have reconsidered accepting them. Miller tried to say again he was being penalized for disclosing more than he had to and then voting to Laxalt being supported by “dark money” groups. But the question itself was damaging enough, and Laxalt was on it, repeating his pledge not to accept gifts that Miller has not joined. And that was it. Closing statements were relatively innocuous, with each candidate stressing his qualifications. They were a stark contrast to the atmosphere in one of the more contentious debates I have seen.